Tud Kent was the original Buffalo River area Forest Service lessee, which is now known as Pond’s Lodge. With the local Island Park community and passing tourist in mind, in 1923, Tud and his wife, Lindy, opened a modest cafe, separate dance hall, and overnight boarding facility. While Tud Kent busied himself with the development of his humble resort business on the Buffalo River, the Targhee Tie Company was well underway, just upriver, filling railroad tie contracts for the Union Pacific Railroad. In 1923, Charles Pond took over the Targhee Tie Company’s Commissary. The entire Pond family moved from Lewiston, Utah, during the summer of 1924, to be with Charles and while he operated the Company Commissary. It was until the late fall of 1925 that Pond managed the commissary. During that late fall of 1925, Pond negotiated a purchase for Tud Kent’s lease and buildings. As the store and tourist resort business in Island Park was only just beginning, the negotiated price was in the $1,300.00 bargain range. From the beginning, the entire Pond family became readily involved in the Ponds Lodge venture. Children Angus, Jennie, Horace, Newell, Glen, Jay, and Dean were all involved in the 1926 construction and expansion of the enterprise. During their first summer, Mrs. Pond took charge of the cafe food preparations, as the rest of the family constructed eight small cabins, along the banks of the Buffalo River. Eight additional cabins were later constructed, all of which were primarily rented by lumbermen, tourists, and sportsmen. As the Island Park area continued to grow, the Pond family introduced a new general merchandise store to the area, complete with food items, fishing supplies, and tools for timber-men. After the original Tud Kent dance hall burned down, during the 1927-28 winter, the Ponds began new developments. Such improvements included an extensive dance hall, with an enormous fireplace, and a lounge, which nestled itself between the store and the dance hall. On July 24, 1935, tragedy seized the Pond family when a fire claimed the entire structure, leaving only the prodigious fireplace standing. Reconstruction began in May of 1936 on a new facility, which is the structure still standing today, flourishing in operation. Charles and Mina Pond retired and handed the business over to the family, with Horace as standing manager. After the death of Charles, in 1955, the business was incorporated, Horace remaining as president and manager. The establishment continued in such a manner, until 1969, when the Pond Corporation sold its interests to Dan Decker. 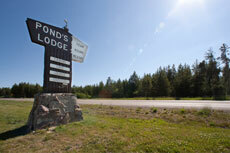 From there, the Ponds Lodge has passed ownership through many capable hands.